1. Cut the beef chuck into 1-inch cubes or strips. 2. Sweat the onion in a large pot or dutch oven with a tablespoon of butter over medium heat. Reduce heat and add paprika, stirring quickly. Add meat and brown on all sides. Add spices, season with salt and pepper and let cook for few minutes, stirring regularly. 3. Add 1/2 bouillon cube and a little water so that the liquid covers the meat. Bring to a boil then simmer for 1 to 2 hours over low heat, covered. The more it cooks, the better it is! Add water from time to time to avoid drying up, but keep the sauce thick. 4. 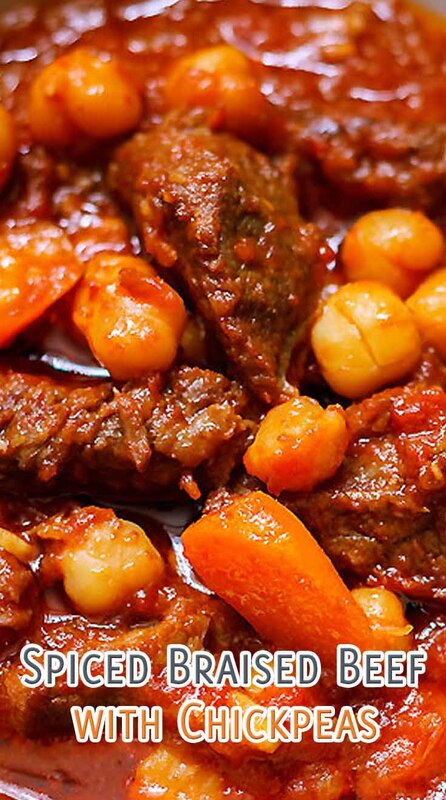 When meat is well cooked and falls apart easily, add chickpeas and tomatoes and finish cooking for 20-30 minutes. Serve warm with herbed couscous.